Where did I come from? What am I suppose to look like? 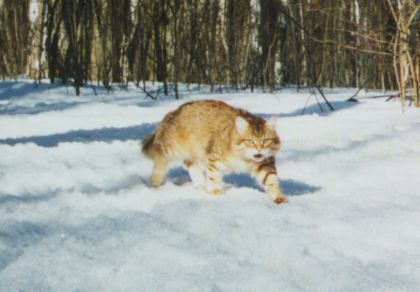 Siberian Cats from the unforgiving climate in Siberia first appeared in recorded history around the year 1000. According to folklore these magnificent animals made their homes in Russian monasteries, where they would walk along the high beams as lookouts for intruders. Their agility, speed, and strength made them worthy opponents in the monasteries' shadowy interiors. But the monks who cared for these animals regarded them as loyal and loving companions. One fact that is undeniable, the Siberian is Russia's native cat. 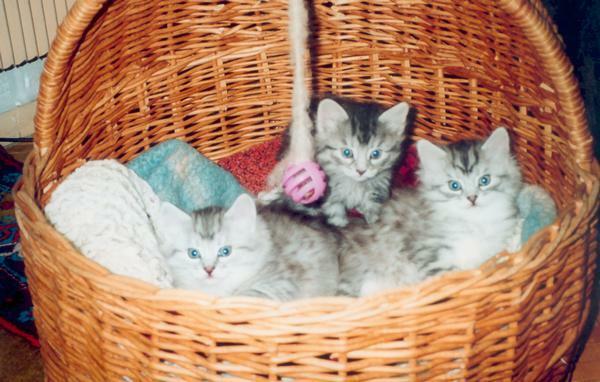 The Siberian cat was one of the three longhairs represented at the first cat show held in England in the 1700's. Colorpoints are a part of our breeding program. Russian People had thought that long ago the feral pointed patterned cats and the feral Siberian cats "got together" along the banks of the Neva River in Leningrad (which is now named St. Petersburg) in the 1960s. First entry into USA, found in a book -- originally published in 1900 by Helen M.Winslow entitled "Concerning Cats," "Mrs.Frederick Monroe of Riverside Ill. owns a remarkable specimen of a genuine Russian cat, a perfect blue of extraor- dinary size. The Russian long-haired pet is much less common even than the Persian and Angora." The first breeding Siberians were introduced in the United States in 1990. Elizabeth Terrell imported the initial kittens. They arrived on June 28, 1990. There names were KALIOSTRO VASENJKOVICH OF STARPOINT, OFELIA ROMANOVA OF STARPOINT and NAINA ROMANOVA OF STARPOINT. The Siberians are fully accepted in all registries except for CFA. The CFA Siberian Cat club established in early 2002 is working hard to advance the Siberian from miscellaneous to full Championship.